When I was a kid and we'd go grocery shopping, my mom was one of the "If it's not on the list, we're not buying it" moms. For the record, she was also an "If it's advertised on television, we're not buying it" mom, but that's not the point of this story. Anyway, at a certain point I decided that I was Very Clever, and wrote "Something good for Jasmin" at the bottom of the shopping list. Vague, but specific enough. Sam, of course, saw the brilliance in my plan and would write "Something good for Sam" under my "Something good for Jasmin". A good idea once is a good idea twice, and as a little kid he could recognize that. "Something good" was often a favorite fruit, but as we got older, Mom would get us "Cocoa Farts" (generic Cocoa Puffs), or our own specific favorite flavor of Ben & Jerry's. It was a little something special- and we still ate nutritious meals, lest you think Mom hung up her Dr. Scholls sandals and abandoned her crunchy muesli ways. It was just a little junk food that we ate in moderation. Fast forward to this last year. Mom has been spending more time here, which we enjoy thoroughly, and our grocery list is out for all to see - and add to. Mom has been carrying on our grocery tradition, and I often find "Something good for Mom" on the list. Sesame seed balls. My favorite Chinese bakery is in downtown Mountain View, and sadly, I don't get there very often. Yesterday ended up being a right-place-right-time kind of day, and I picked up a box of these goodies for us to enjoy. After all, Mom also taught us that the best part of "something good" is having enough to share. Oh my, how I LOVE that story! My daughter Corrina used to add things to the grocery list, but she was a little sneaky, smart but sneaky, about it. She would sneak her item or two in between other items and try to copy my handwriting. Ah, memories, now they are something that lasts forever. Thanks for reminding me. I'm on my way over to share the "something good"! That is such a sweet story. I hope your mom is doing well. I love you guys. Thanks for sharing this great story. OMG, I love those things. Our local asian market has those at times and you have to be there early so its a rare treat. Nummy. Now, which bakery is this...? All I can say is, it's a good thing that your LYS does not advertise on TV. YUMMY! I wonder if the restaurant we're going to tonight has those? OMG..those things look sooo good! And awesome post! I shall add something good for Fru onto all my lists! Oh! 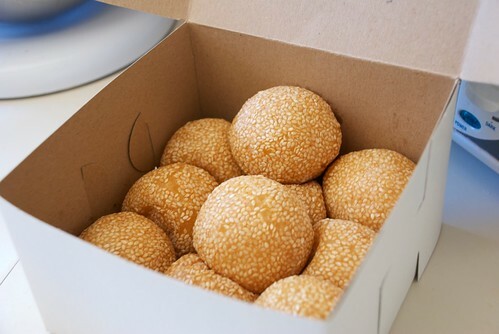 I LOVE sesame balls. We grew up on them as kids as treats.